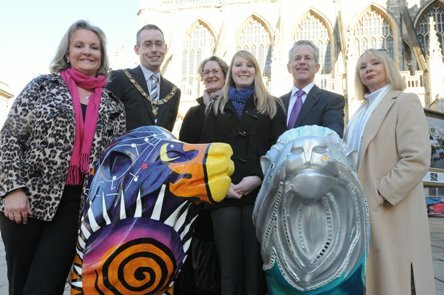 Streamlion was purchased at the Lions of Bath Auction by the Quartet Community Foundation. This lion was decorated on behalf of the Larkhall Traders to represent Larkhall Village. Several ideas were submitted and considered; however the chosen design was a lion representing the ancient, hidden and secret watercourses of Larkhall, Charlcombe and Swainswick - which once bubbled from the earth as spas and flowed as bright streams through our lush green valley. The original design in pen and crayon giving an indication of the final product, to be done in mixed media: acrylic paint, spray paint and mosaic tesserae. The blank lion in the studio - made of fibreglass with industrial primer sprayed on. This had to be well sanded down before applying paint. Mirror tiles were used to follow the sculpted lines of the mane and then continued to flow in lines across the body. These reflected dancing motes of light onto the wall behind, so that when viewers walked past Streamlion, the lights moved along the wall and along the lion's body like streams of water. Streamlion was expertly hung in place by Ironart of Bath. Because the lion would be viewed from beneath, the belly and inside of each leg was painted more brightly- as if lit from below - with bubbles and a newt and frog swimming in green sunlit water. Streamlion in the Lions' workshop (old Bath Press building) where all lions were restored before the final show.